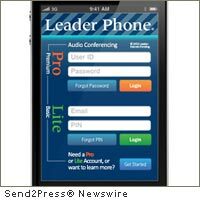 The Leader Phone iPhone app is different from other audio conferencing apps because it taps the power of the innovative engineering of both Leader Phone and the iPhone. The Leader Phone iPhone app includes advanced features such as call recording, call reminders, group calling (the Call Now! feature) and automatic add-in of late participants. Leader Technologies® Incorporated is a software development and marketing company specializing in social media and unified communications. Its technologies are patented and patent pending. Its brands include Leader Phone® audio conferencing; Leader Meeting™ web conferencing; Leader Alert® for voice, text and email alerting; Leader® Voice Mail for social services virtual voice mail; and Leader2Leader® social media platform. Leader provided the primary communications and collaboration system for the Governor of Louisiana in the state’s Hurricane Katrina life-saving and disaster response. Leader has also provided counter terrorism support and alerting technologies to the Departments of Homeland Security and Defense. In the wake of the Virginia Tech tragedy, Leader Alert® is now deployed with increasing frequency within secondary and higher education for school safety and security applications. On July 29, 2009 Leader and Facebook met in the State of Delaware in a federal patent infringement trial filed by Leader – Leader Technologies, Inc. v. Facebook, Inc., Case No. 08-CV-862-LPS where a jury ruled against Facebook for “literal infringement” of Leader’s patented technology U.S. Patent No. 7,139,761 that is the engine driving the Facebook website. In the split decision, the jury ruled against Leader for alleged premature commercial activity. Leader has asked the judge to set aside the adverse rulings on commercial activity for lack of any evidence as a matter of law. Both sides have filed post-trial motions and await the judge’s rulings. Click http://www.leader.com/leader-v-facebook-cv-08-862-JJF-LPS to view post-trial motions. For additional information, go online to Leader Phone® http://www.leaderphone.com or contact John Needham at (614) 890-1986.